The crew here at BOTWF hopes everyone had a great holiday season and your new year has started well. We’ve been busy here updating the website and getting ready for 2012. The 2012 calendar is now loaded and the 2011 calendar and 2011 News have been archived. We’ll maintain a link to all of our archived pages at the top of this page. Well, we still have a bit of time before butterflies start flying here in the U.S. However, for planning your events for this year, now’s the time to contact us. Even during the winter, we can give our presentations indoors. The BOTWF has already been receiving emails and phone calls, and dates will start filling fast. Check out our Programs page to see what we offer. Along with presentations, Bryan’s been planning photography trips. He also just finished his selections of his favorite butterfly photos for 2011. Click here to see them. Work is still slowly progressing on completing the species treatments and Caitlin has finished several new range maps which have already been loaded to the site. Many more exciting projects are in the works for 2012 and we’ll keep you up to date with regular updates. The weather is warming and butterflies have already been seen here in our home state of Oklahoma. So far all of them have been species that overwinter as adults, such as Mourning Cloaks. But new, freshly emerged, adults shouldn’t be too far behind. News from here includes Bryan finishing the species treatments. Also, while going through images for his photography business clients, he found several that he thought should be loaded on this website. A total of 52 species have new images added. Here’s the list, and hopefully, a few of your favorites are here. Check them out and let us know what you think. Bryan is now in the process of getting a few species prepared to load that he photographed in tropical South America. Please keep checking right here for updates. Things have quickly warmed up here in central Oklahoma and fresh butterflies are flying. Spring break is just a couple weeks away and the BOTWF is scheduled to give a total of four presentations during that week for the Wichita Mountains National Wildlife Refuge, here in Oklahoma. We’ll be giving the popular presentation, Butterflies...Here Today, Gone Tomorrow?, on the 17th and 24th of March at 1100 and 1400 both days. If you’re in the area, please plan to attend. All the presentations are free and open to the public and will be held in the theater room of the Visitor’s Center. Have you been brushing up on your butterfly identifications and getting ready for the season? Here’s a test: Can you identify the four butterflies gathering nectar from the wild blue indigo in the photo to the right? The photo was taken on 7 May 2006 at the Lexington Wildlife Management Area, Cleveland County, in central Oklahoma. 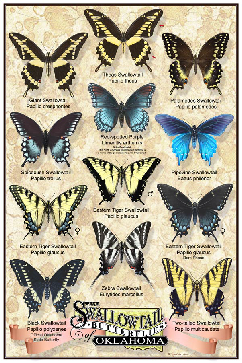 Here’s a hint, there are three different species and the top and bottom butterflies are the same species. Email us here with your guesses and stay tuned to the next update for the correct answers. Also, several more presentations are being worked out for the year. In April we’ll be at the 6th Annual Arbuckle-Simpson Nature Festival. Please keep checking our calendar for more and if you’re a member of a club or organization, a teacher, librarian, etc. and would like to schedule a program, please contact us for details. Spring is erupting here in central Oklahoma. The plums and redbuds are in full bloom and fresh butterflies are flying. We’ve also been getting some badly needed rain. Bryan gave two presentations to eager audiences at Bradford Village in Edmond, Oklahoma, on 12 March. Last Saturday he was at the Wichita Mountains National Wildlife Refuge for two presentations and he’ll be there again this weekend for two more. Since we’re based out of Oklahoma, many of the butterfly activities we do are in our home state. During our presentations, we encourage people to track or list the species they see if they wish and also to report new county records. We often get asked about a list of county records in Oklahoma and there is actually one available. Thanks to John Fisher and John Nelson, this list is found here. Thanks to these two gentlemen for compiling and maintaining this list. Bryan gave two more presentations to the Wichita Mountains National Wildlife Refuge on 24 March which were very well received. Another big event is planned for the 27th and 28th of this month; The 6th Annual Arbuckle- Simpson Nature Festival held in Tishomingo, Oklahoma. On Friday, the 28th, Bryan will give a butterfly photography workshop from 0800 until noon. This will include a classroom session followed by going into the field to find and photograph butterflies. Bryan will also give the highly acclaimed presentation, “Butterflies...Here Today, Gone Tomorrow?” as the keynote address in the evening. We hope to see you there! There’s been a lot of activity here at the Butterflies of the World Foundation since the last post. Bryan was at the The 6th Annual Arbuckle- Simpson Nature Festival held in Tishomingo, Oklahoma, on the 28th of April. That morning, he gave a butterfly photography seminar and that evening he was the keynote speaker with the ever popular presentation, “Butterflies...Here Today, Gone Tomorrow?” There were eager participants at both events. The next scheduled speaking occasion will be next month at the Mt. Magazine Butterfly Festival, Mt. Magazine State Park, near Paris, Arkansas, on 22 and 23 June 2012. One of the highlight butterflies in that area is the stunning Diana Fritillary. If you’re in the area at that time, we highly encourage you to come for the festivities and a chance to see this beautiful insect. 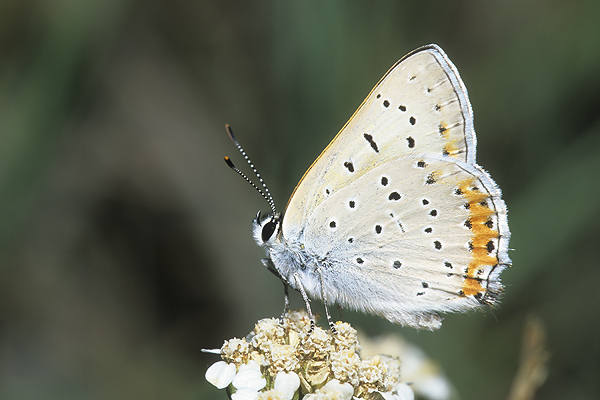 Other butterfly activities that have been posted on our calendar are several butterfly counts. For those just starting out learning your local butterflies, we highly recommend participating in a butterfly count. What happens at a count is everyone is divided up into small groups with a ‘leader’ for each group. This person is usually a local expert on the local butterflies and typically these people are very eager to help others who are interested in learning the local butterfly fauna. You head out with your group to designated places at the count location, sometimes even to areas the public may not normally be allowed. Then you count every species, and how many of them there are. If you hang with your group leader, or other seasoned butterfliers, you’ll quickly learn the butterflies in that area. Besides counting butterflies, photography of them is another rewarding endeavor. Bryan was out to several locations in Oklahoma this spring chasing many species. On 31 March, he was in Sulphur, Oklahoma, looking for adults of the Frosted Elfin. You can read about the hunt in the 2011 News Archive. This was an exciting find and not only did he get photos of them, but he also got them ovipositing. And to make things even better, after the Frosted Elfins, he drove the ten minute drive to the Chickasaw National Recreation Area and was able to find and photograph some Yucca Giant-Skippers, another new one for him. There, he also saw and photographed some amazing behavior such as courting, mating and ovipositing. He also got some high magnification shots of eggs. Bryan said it was one of the most memorable days he’s had for a long time. Bryan has also been photographing larval food plants (associated butterflies in parenthesises) and this spring he was able to get wild plum (Coral Hairstreak), redbud (Henry’s Elfin), various violets (Great Spangled Fritillary and Variegated Fritillary) and fresh emerging post oak and blackjack oak leaves (Oak Hairstreak, Banded Hairstreak, Horace’s Duskywing, Juvenal’s Duskywing and Sleepy Duskywing). Another subject Bryan’s been looking for are immature butterflies. He photographed a Question Mark caterpillar on elm and a Variegated Fritillary strangely on a cactus. Perhaps it was searching for a place to pupate? This has been one of the best years to observe butterflies in our home state of Oklahoma in a long time. We hope you’ve been able to enjoy it and we’ll see you at the next update. On 11 May, Bryan was in Stillwater, Oklahoma, at the Oklahoma State University Botanical Garden for another filming of a butterfly segment for the Oklahoma Gardening program. After the filming, the Garden held an open house for the public and Bryan gave butterfly tours. Even during the rainy day, butterflies were found. Highlights were Variegated Fritillary caterpillars on passionvine, one that had freshly pupated and another in the process of pupating. The kids especially liked it. June is just around the corner and it will be a busy month for the BOTWF. Trips are planned all around our home state and into Arkansas and Texas. Several butterfly counts are scheduled and we’ll reiterate how important these are for those of you who want to get to know your local species. You’ll get into great habitats, see great butterflies and meet like-minded people who enjoy sharing their knowledge. Hopefully, we’ll see you at one of the counts. Check out our June calendar for the dates, times and locations. but there were still a few butterflies to be found. Bryan was also interviewed for the Festival and a clip can be found here. Bryan was also in Stillwater, Oklahoma, at the Oklahoma State University Botanical Gardens for more filming segments for the Oklahoma Gardening Program. If you’re in Oklahoma, stay tuned to the local PBS channel to view the segments. They have also recently loaded two previous pieces on their Youtube channel. Here they are in order: March and April. In more news, there will be an upcoming presentation and field trip at the Martin Park Nature Center in Oklahoma City, Oklahoma, on 11 August 2012. It is free and open to the public. Keep checking our Calendar for more events and contact us if you want to schedule one for your group. We hope you enjoyed this update. It’s been a while since the last update and as always, we’ve been busier than ever. Most of the work lately has been the indoors type, scheduling presentations and working on our extensive file of photographs. This is because of the extreme heat wave and drought that has gripped our area over the summer. We had several days in a row of well over 100 degrees and one day it hit 115 degrees. There was little rain to speak of and as everyone knows, a terrible fire ravaged a large swath near our headquarters. The southern edge of the Cleveland County fire was just a couple miles north of us. If the wind had changed directions, it’s likely it would have been disastrous for us. So, due to the weather, not many photos were obtained during this period. In happier news, Bryan gave a presentation on 11 August to the Martin Park Nature Center, in Oklahoma City. It was very well attended and the younger kids had a ton of very informed questions and observations. An attempt was made to do a walk afterwards, but due to the extreme heat, it was cut short. In other news, more BOTWF segments were aired on the Oklahoma Gardening program on the Oklahoma PBS channel and we have loaded them here just in case you missed them. The next segment in the works will be about the Monarch, and its epic journey. The fall migration can be very noticeable in our area, since central Oklahoma is a major flyway for the species. And finally, more presentations are scheduled. Many of these are free and open to the public. For September, we will give a butterfly photography seminar in Lawton, Oklahoma, for the Wichita Wildlight Photographic Society on the Thursday the 13th. Then on the 17th we’ll be in Norman, Oklahoma, to give the popular presentation, “Butterflies...Here Today, Gone Tomorrow?” to the Cleveland County Herb Society. And finally we’ll be at the Monarch Migration and Butterfly Festival which will be held at the Jerusalem Community Center & Park near Cole, Oklahoma, on Saturday the 29th of September. That’s all the news from here. Fall is a great time for observing butterflies. The cooler temperatures make it much more bearable for humans and the butterflies tend to allow closer looks. So, get out there and have fun. Kim Toscano and Bryan discuss larval food sources. Kim Toscano and Bryan discuss tools for identifying butterflies. Today, Gone Tomorrow?”, to the Cleveland County Herb Society. On the 19th, he was at the Oklahoma State University Botanical Garden for another filming of a butterfly segment. Then on 29 September, he was at the Monarch Migration and Butterfly Festival, held at the Jerusalem Heritage Center near Cole, Oklahoma. And on 3 October, he was at the Cann Garden Center in Ponca City, Oklahoma, to give a presentation. On the 5th through the 7th both he and Laura were at the Oklahoma Bioblitz, held at Foss Lake, Oklahoma, where they helped with surveying butterflies and gave another presentation. Then on 10 October, it was back to the OSU Botanical Garden for another filming. And finally, Bryan went to Drumright, Oklahoma, to give another butterfly photography seminar on 20 October. All of the appearances were very fun with enthusiastic crowds at all of them. The next scheduled event will be a butterfly presentation at the Fall Festival for Journey Clinic, in Moore, Oklahoma. The Festival is from 1100 to 1600 and Bryan will present at 1300. The event is free and open to the public. Keep a watch on our calendar for more events, and if you need one for your group, please don’t hesitate to contact us. Even with the summer heat and busy schedule, Bryan was able to get in a little photography. Just as many photographers can attest, sometimes common subjects are elusive. Such was the case for him and the Phaon Crescent, a common enough species in his home state of Oklahoma. Well, in September, he finally got some photos and that species now has a treatment page. Other highlights are to the right. That’s all the news for now. Keep checking back, as many new things are in the works for the BOTWF. With very unseasonably warm weather, butterflies are still flying in our local area here in central Oklahoma. Recently observed species include the Gulf Fritillary, Orange Sulphur, Dainty Sulphur, Little Yellow, Variegated Fritillary, Red Admiral, Question Mark and Bordered Patch. Besides observing butterflies, we’ve been making some minor changes to the website. The Butterflies page now has a couple new options. One came from a request to add a direct link to the Monarch species page. Also, since we’re based out of Oklahoma, we decided to add a page that has a list of all 194 species that have been documented from our state. Granted, we don’t have full photographic coverage of all 194 species, we’re at about 80% and climbing, but we thought a state list would help local butterfly enthusiasts. And finally, we get a few emails per month asking about our coverage of at-risk species, so we’ve added direct page-links for three species, the Regal Fritillary, Arogos Skipper and Dakota Skipper. Besides the website updates, Bryan gave a very well received presentation at the Fall Festival at Journey Clinic in Moore, Oklahoma on 3 November 2012. Our next presentation will be for the Gladiolus Garden Club in Purcell, Oklahoma, on 14 November 2012 at 1330. It will be held at the McClain County OSU Extension office. It is free and open to the public. Keep an eye on our Calendar for more events. Speaking of events, we’ve added another program called “Train the Trainer.” This intensive course has been developed specifically for park/refuge personnel, master naturalists, scout leaders, teachers, etc. It is a day-long program covering all aspects of butterflies including biology, ecology, conservation, observation and more. The morning will be dedicated to the classroom with a field-trip in the afternoon. The intent of this program is to train personnel (or refresh their knowledge) so that they can pass what they’ve learned on to their students, the public, etc. If you’re interested, contact us for details. And finally, we’ve been very busy this year with presentations, programs, field trips, and butterfly counts; a total of 35 so far. Last year we did 33 various events. Most of these were free and open to the public and for many of them, the BOTWF received little (or no) compensation for our time and travel. We’re also constantly on the road for photography, travelling to various parks, refuges and other wild areas obtaining images for the BOTWF to use in our programs and presentations, our website, or to officially document species. All of this work is expensive to do and for that reason, we need your help. Please consider a tax deductible donation to the Butterflies of the World Foundation. All credit card donations are processed by PayPal. Click the link below to donate with your Visa, MasterCard, American Express or Discover card, or to donate using your funds from your PayPal account. Or if you prefer to send a check please go to our Support page for instructions. We are a 501(c)(3), tax exempt organization and you will receive a receipt for your donation of $25 or more. The Butterflies of the World Foundation is proud to bring Annie Hart on board as our grant writing and fundraising specialist. Annie is the creator of the highly acclaimed annual Monarch Migration and Butterfly Festival held each year at the Historic Jerusalem Community Park near Cole, Oklahoma. We’re excited to bring Annie’s passion and zest for butterflies to the BOTWF. Click here to learn more about her. The Butterflies of the World Foundation was at the Gladiolus Garden Club in Purcell, Oklahoma, on 14 November 2012, where we gave a presentation to a packed house of eager butterfly enthusiasts. It was evident they came away completely satiated with tons of information about their local butterflies. On 29 November, The BOTWF will give another presentation at the University of Oklahoma in room 260 of Richards Hall. There is limited space, but if you’re on the campus that day, pop in for the show. Even though we’ve had a few frosty mornings here in central Oklahoma, Bryan wanted to let people know he’s still seeing butterflies out flying once the day warms up. Common encounters include both Orange, Clouded and Dainty Sulphurs and a few Painted Ladies. The Butterflies of the World Foundation is proud to announce two special edition art posters created by Oklahoma artist Kevin Hopkins. 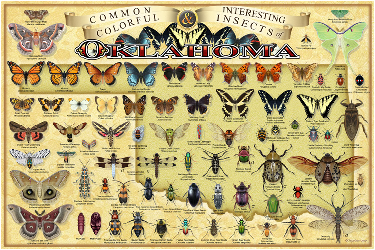 Only ten of these wonderful, 20”x30” fine art posters will be available for the holidays, "Interesting & Colorful Insects" or "Swallowtail Butterflies" of Oklahoma, each signed by the artist and suitable for framing. A tax deductible $100 donation will reserve one limited poster of your choice and help us continue to excite people about butterflies and safeguarding their habitat. These beautifully designed, colorfully detailed posters are only available by reservation by calling Annie Hart at 405-485-2962. Make your donation to The Butterflies of the World Foundation via the Paypal link above. When your order is confirmed, you will receive your poster in a protective mailing tube via the USPS. Framing is not included. Click on each poster to see them in greater detail.